Figure 1. White Spinning Top (basic candle). 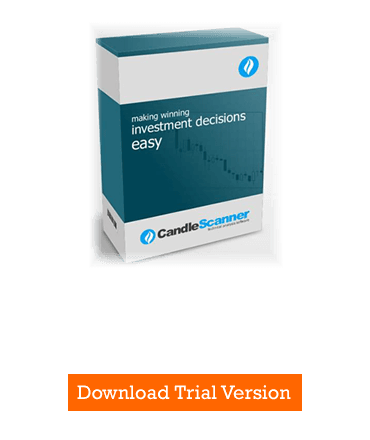 This article describes the White Spinning Top basic candle. Spinning tops are candles with very small bodies. They are different in nature compared to long candles, which show the strength of the trend. In this case we are dealing with indecision. The significance of a spinning top largely depends on the current situation on the chart. If one or more spinning tops occur in a stable market, it does not mean anything in terms of predicting how prices will evolve. 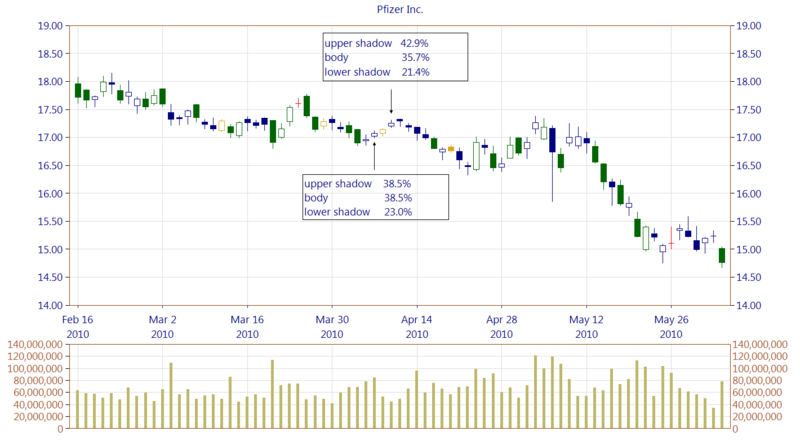 However, when the market is growing rapidly and there is this type of a candle -- long shadow(s) and a small body -- this means that, despite large fluctuations during the session, the market does not have the strength to continue the current trend. The confirmation of this weakness may be the emergence of black candles after the spinning top. When spinning top appears following a clear trend (downtrend or uptrend) their importance is greater, if at the same time we notice a rapid increase in the volume -- this situation should be considered as a potential signal of the trend change. In the case of a spinning top, the color of the body, in principle, is of no importance, so the interpretation of Black Spinning Top and White Spinning Top is identical. Figure 2. There may be occasions where there is a problem in distinguishing the spinning top from a candle, i.e. Short White Candle, White Candle, Long White Candle and their black counterparts. The main difference is that the shadows in candles cannot be longer than the body. In the case of the spinning top, marked in dark blue (see CandleScanner Color Theme), at least one shadow must be longer than the body. Figure 3. 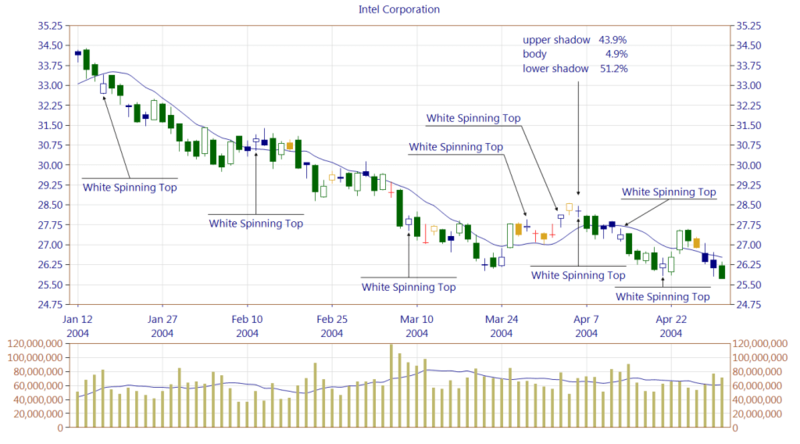 The same problem may arise with distinguishing a spinning top from a doji. Just to remind: a spinning top is marked in navy blue, the doji is marked in red. The figure shows the White Spinning Top (with values of the candle elements), which can be regarded as a doji candle because the body is very small (4.9% of the whole candle).